Cooking recipes soups very much. 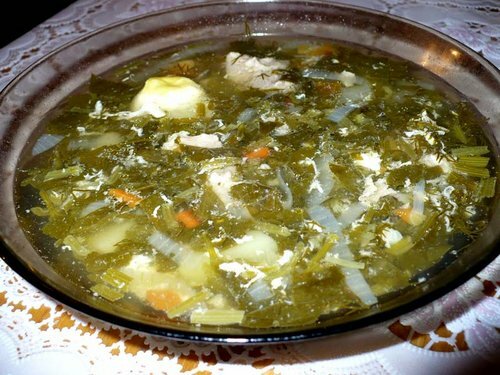 The most common in the summer, is a soup with sorrel, which is also called "green" because of the predominance of greenery. His sourness he brings in a distinct, not similar in taste. Sorrel has a positive effect on the body and helps revitalize the various internal organs. Recipe of soup of sorrel is very easy to prepare and contains many components. Chicken fillet wash and cut into strips. Dip it in a saucepan, cover with cold water and put on fire. When the water boils, then reduce the power of fire, remove formed on the surface of the foam. Peel the potatoes, wash and cut it into small cubes. Put in a saucepan. Simmer for twenty minutes. Wash the sorrel leaves, dry and cut into thin strips. Put to boil two eggs. After they are cooked,fill them with cold water. Then peel and finely chop. Put in a saucepan. Take greens, wash thoroughly and Pat dry it. Then finely chop. Clean the onions, rinse under cold water and finely chop. Put in a saucepan. When the potato is almost ready, add in boiling water chopped sorrel. Season with salt and pepper. Simmer about ten minutes. Meanwhile, whisk the remaining 2 eggs and add to them a hundred and fifty grams of sour cream and carefully pour, while stirring, the oxalic Cup of hot broth. Then, repeat the procedure – pour in another Cup of broth. Should get a homogeneous mixture, which very carefully, thin stream, put it into the pot with the sorrel, without ceasing to stir. Then add two tablespoons of lemon juice and turn off the stove. The table can be served as chilled, and hot, sprinkled with chopped greens. For soup it is better to use a more Mature and dark sorrel, and the first fresh leaves to leave for the salad. Abuse sorrel should not be, especially those who suffer from kidney diseases, as this plant contains large amounts of oxalic acid, irritating the liver. To decorate the soup with the sorrel can be boiled more eggs, cut them in half and put in each plate half. To vitamins better preserved, washed in running water, immerse the greens for 2-3 minutes in boiling broth. Then RUB it through a colander or chop with a knife. Green mass simmer for 5-7 minutes and put in stock ready.